We spend months planning the perfect nursery for our new arrival only to spend the first few weeks (or months) with baby bedside. Great design shouldn’t be limited to the four walls of the nursery. Whether you’re on-the-go or having baby sleep in your room for awhile, great style shouldn’t be left behind! Babyhome’s Dream Cot pairs together our two favorite things—functionality and amazing design. One Project Nursery reader will win a Babyhome Dream Cot in your choice of color. The Babyhome Dream Cot is not your typical portable crib. 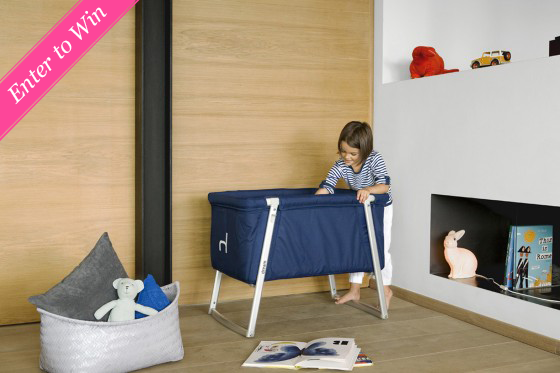 The cot has an ultra sleek and lightweight design, making it the perfect fit for the modern parent. Its innovative adjustable leg system allows, with the click of a button, to change the leg position from stationary to a rocker to wheels that let the Dream Cot be moved easily around the house. WIN IT! One Project Nursery reader will win a Dream Cot in your choice of color. This prize can only be shipped within the United States. This would be perfect for our new bambino! I would choose charcoa/grey. LOVE! I would go with Navy. Hard to choose though! Have had my eye on the sand one for months! I love the white one. So pretty! I would pick the Turquoise color, love it! I love the raspberry color! Love the sand color – it would blend in perfectly with my decor! Grey would be perfect for any decor! Lime, sand, white or black are so cute!! I think I would pick the turquoise; so bright and goes with a lot of kid themes! lovely! the oilo pattern is fun and neutral. love it. I’d definitely pick the BabyHome Dream Cot in Turquoise! It would be perfect for our little guy who’s due to arrive in less than 6 weeks! I would like one in black. I would love one in Sand! I love the turquoise color! But sand would go with everything! Scratch that…I’d go with the patterned one! I can’t see the name of the color. So cool! My due date is Friday, I could really use one of these! I would pick the sand color w/ pebbles. We have been so disappointed when looking for a portable crib to take with us when we adopt and this is it!!! A turquoise or navy one please!!! lime is great! Or sand Ashley O.
I love the sand color! I like the teal one! Love this. It would be wonderful to have for my new addition arriving in October. Nice design. I would pick the sand color, though all the colors are very nice! So pretty. Any color is awesome. Love all The colors but I think I would go with the lime! Great for a little boy or girl. We are expecting our first – I’d love one in either Charcoal or Lime! I love the navy or the teal! I have totally wanted this! It would be perfect in our house! The Sand color would best match our nursery! I would love it in purple!!!! How fantastic, just the right size for our little home! my bff has a newborn and she would totally love this thing! i like the teal. I love the oilo pattern – it’s so fun! Love the grey. This is exactly what I have been looking for. I would choose the charcoal grey. Beautiful! LOVE the teal! My favorite color! I love the sand, it would go well in every room in my house! I also love the giraffe and gray! I like the sand color, it would look nice our bedroom! Oh, navy I suppose:) thank you! This thing is BAD!!! I love it! I especially love the Gray and the Giraffe? Print! I don’t need this as I actually bought one in a cool grey off of Giggle. It is AWESOME! Even my skeptical husband loves it. It is SOOOO easy to put together. Really, it is an ingenious design. We bought it since we will be staying with family with a newborn when our adopted child is born. It comes with two sheets, along with the mattress and mattress pad. It is a DREAM! So, ladies, even if you do not win one, get one!!! I love the natural/tan/beige color! I like the sand or the turquoise. Such nice color options! teal please! i love it! Love the sand and teal! Dream cot looks awesome!! I would love the navy blue! Thank you for the great products and opportunity. All of the colors are scrumptious, but I am smitten with the Lime! I would pick the lime green, I like gender neutral colors so it can be used again for a second baby. I love the grey/white pattern..
I’m a grandma to be. Love to accomodate my precious ones in style and comfort when they come to visit. Grandma’s are known to spoil…. i love the oilio color! I like both the sand and the pattern one. So hard to choose! I would choose the turquoise one! Love LOVE Love the charcoal/grey!!! This is a fabulous idea!! This would be perfect just in time for summer vacations! Hmmm. This is a hard decision. I’d maybe choose Sand or Navy. Thanks for this giveaway. I want one of these so badly! I love the brown, grey and the teal! I’d pick the white one! I would love this in white for my little one when they arrive! I’m a big fan of the turquoise! Sand would match our home the best. I love the navy! It’s perfect for a boy or a girl! I like the charcoal. Or red. I like the Dark blue color! The cot in the print fabric is great! We would love to win one of these for baby #2, due in August…but which color to choose?!?!? ah i love the teal!!! I like the brown or black. I love the Teal colored one!! I like the navy color best. Too cute! Think I would pick the teal or brown. 32 weeks pregnant & would love to know she can sleep safely outside of her nursery… especially since we are currently removing wallpaper in her room & it’s empty :) Great Giveaway! I would love the Babyhome Dream Cot in Cobblestone!!!! I would choose the Teal. I would pick the turquoise, love it!!! This is so sleek and modern… I love it! Looks wonderful, it would be a great addition in charcoal. So many great colors to choose! I would probably go with the tan to have it blend into the house. I would definitely choose the white one. I love the turquoise/teal color, but I’d probably go with the sand color. Navy or gray – but all the colors are cute! Turquoise is such a lovely punch of color! Sand would work best with our decor. This is very convenient and stylish! Love it! white…fresh, clever and simplistic for any modern nursery/home. All of the colors are beautiful, but we’d love the orange or lime green! I’d pick the dark blue. The grey with white “spots” is my favorite! We’re due in December and not going to find out the gender until then, so this would be perfect!!! I like the grey giraffe print. I would love one in black please!!! I love Sand! These are adorable! All the colors are great. I love all the bright colors but I think I would choose Sand! I love the grey and white giraffe print. Navy blue is so lovely. I would pick lime. It is nice and bright and cheerful! Baby boy is due July 4th! This would be amazing :)!! The black would be perfect! Turquoise would be awesome for my baby boy due July 1st! I love the teal and lime! I would love to have the sand colored one!!!! I love the taupe colored one!! I can’t find the actual color, but this product rocks!! Genius for Mama’s room and traveling to the in-laws. I’d choose one in Sand. I love the black, would be great when we visit Aiden’s grandparents!!!!!! What a cool baby cot! Wish this was around for Baby #1! Would love it in Sand for Baby #2! This would be great! Any neutral color would be fine. This would be perfect for my friend who is expecting! I would let her pick the color! I love the white. Classic and modern. Looks amazing, would love to have one! I like the giraffe print and the white! I would love the navy cot! So beautiful and stylish. I would go with the navy blue. Love the Navy colored one. Fingers crossed! I like the sands one. Thank you for this great giveaway! I’d love this in white! I would choose one in Sand! The black and navy colors are nice too! So many pretty choices! I would probably choose a neutral safe like tan but the others are fun! I love the oilo patterned cot. Cute and neutral! I like the green one. I am not sure what shade of green that is but I love it! i love the tan one! I would probably go with the white or sand but the lime and turquoise are so fun! sand or red for us! I love the turquoise! It’s a fun color, combined with simple design.